Have you ever found yourself staring at a WIP not knowing where you left off? Have you ever started to fill out a quilt show form and realized you didn't have all the details needed? There are several missing details on quilts I've made that I sure wish I would have better tracked! 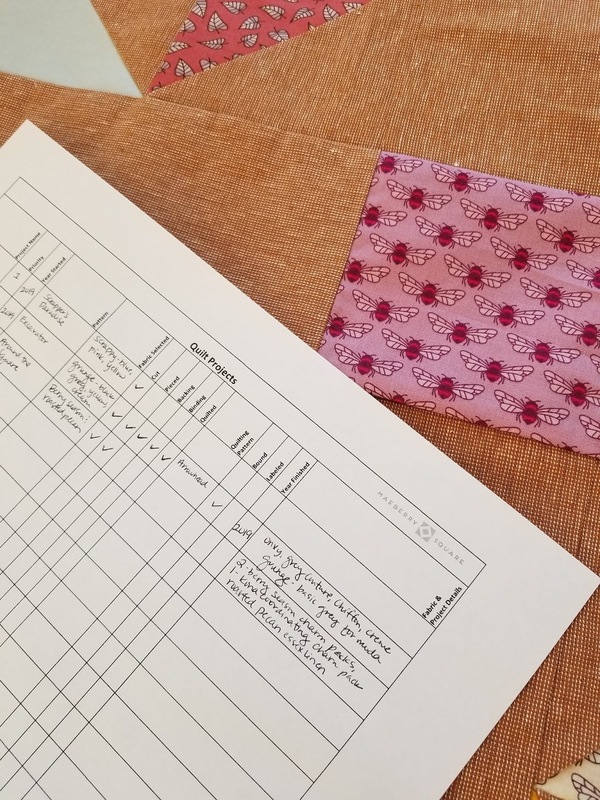 A couple years ago, I started a quilt project tracking document to keep better record of my quilts. The document has basic information like project name, year started, pattern, fabric, status (cut, pieced, quilted, bound) and year finished. There's also a general notes field so I can add whatever detail I'd like to have down the road. It's been exciting to look back at the document and see what I've accomplished! I have a current projects tab and a completed projects tab so I have an accurate look at what I'm working on. I tend to work on 10-20 projects at a time, so it's easy to forget where I was or what else I need to work on without the document. Since I am a pattern writer, I also have fields to capture related information. In addition to my big picture look at quilt projects, I also have a project-specific document I keep for most projects. It has details about the specific project as well as a really large notes field that I can keep updated throughout the project. This helps reminder me of new skills learned, major issues encountered and last status, especially so that if the project ends up sitting around for a month, I can remember where I left off or even what problem I was struggling with before stopping. Both documents have been helpful in my process and pattern business management. The documents are works in progress and ever-evolving. Do you keep track of your quilting projects? Is there particular software or documentation you use? I've created a basic Quilt Project Tracker PDF document that you can print and use as a first step if you're interested in tracking your projects. It's a good foundation to use if you haven't been tracking anything (you can always build your own customized one later). Click here to open the PDF and print. If you decide to use it, do me a favor and share a picture of it on Instagram using the tag #quiltprojecttracker and tagging @maeberrysquare! Thanks!